With a lower interest rate, you pay more principal with each payment, especially in the first years of the loan. EXAMPLE: After five years of payments on a 30-year loan of $200,000 at 4% you would pay $19,706 in principle vs. $17,105 on the same at 5%. That’s an extra $2,601 in benefits on top of the $7,052 of interest savings. Total advantage = $9,653. Pay extra principle: Apply your monthly savings toward principle to shorten your loan term by several years. EXAMPLE: using the same loan terms from above, pay your $118/ month savings as extra toward principle and cut the loan from 30 to 24.33. 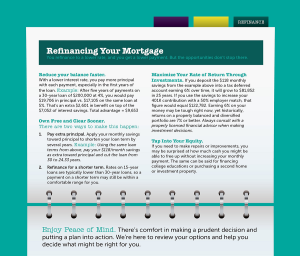 Refinance your mortgage for a shorter term: Rates on 15-year loans are typically lower than 30-year loans, so payment on a shorter term may still be within a comfortable range for you. If you deposit the $118 monthly saving form the example above into a tax deferred account earning 6% over time, it will grow to $81,852 in 25 years. if you use the savings to increase your 401K contribution with a 50% employer match, that figure would equal $122,782. Earning 6% on your money may be tough right now, yet historically, returns on a property balanced and diversified portfolio are 7% or better. If you need to make repairs or improvements, you may be surprised at how much cash you might be able to free up without increasing your monthly payment.